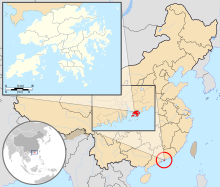 Hongkongers (Chinese: 香港人), also known as Hong Kongese and Hong Kong people, are people who originate from Hong Kong. These terms are a special identity for those who hold the legal residency in Hong Kong. Most of the Hongkongers were born and bred, or at least bred in Hong Kong sharing the same set of core values of Hong Kong. The terms itself have no legal definition by the Hong Kong Government; more precise terms such as Hong Kong Permanent Resident (Chinese: 香港永久性居民; Cantonese Yale: Hèunggóng Wínggáusing Gēuimàhn) and Hong Kong Resident (香港居民; Hèunggóng Gēuimàhn) are used in legal contexts. However, the word "Hongkonger" was officially added to the Oxford English Dictionary in March 2014. Cantopop (Chinese: 粵語流行音樂, a contraction of "Cantonese pop music") or HK-pop (short for "Hong Kong pop music") is a genre of popular music written in standard modern Chinese but sung in Cantonese. Cantopop is also used to refer to the cultural context of its production and consumption. The genre began in the 1970s and became associated with Hong Kong popular music from the middle of the decade. Cantopop then reached its height of popularity in the 1980s and 1990s before slowly declining in the 2000s and slight revival in the 2010s. The term "Cantopop" itself was coined in 1978 after "Cantorock", a term first used in 1974. Cantopop reached its highest glory with a fanbase and concert reaching Mainland China, Taiwan, Singapore, Malaysia, South Korea, Japan especially with the influx of songs from Hong Kong movies. The "March of the Volunteers" is the national anthem of the People's Republic of China, including its special administrative regions of Hong Kong and Macau. Unlike most previous Chinese state anthems, it is written entirely in the vernacular, rather than in Classical Chinese. The Royal Hong Kong Regiment (The Volunteers) (RHKR(V)) (Chinese: 皇家香港軍團(義勇軍)), formed in May 1854, was a local auxiliary militia force funded and administered by the colonial Government of Hong Kong. 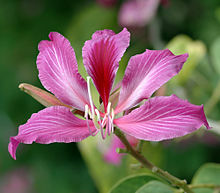 Bauhinia × blakeana, commonly called the Hong Kong Orchid Tree, is a legume tree of the genus Bauhinia, with large thick leaves and striking purplish red flowers. The fragrant, orchid-like flowers are usually 10 to 15 centimetres (3.9 to 5.9 in) across, and bloom from early November to the end of March. Although now cultivated in many areas, it originated in Hong Kong in 1880 and apparently all of the cultivated trees derive from one cultivated at the Hong Kong Botanical Gardens and widely planted in Hong Kong starting in 1914. It is referred to as bauhinia in non-scientific literature though this is the name of the genus. It is sometimes called the Hong Kong orchid (香港蘭). In Hong Kong, it is most commonly referred to by its Chinese name of "洋紫荊". Also see "Kanchan Flower"(Bengali) for reference. Native women in Hong Kong used to be situated within the context of Chinese family and society, in which they were treated the same as Mainland women or Taiwanese women. Under the traditional Chinese patriarchy structure, the society was male-dominated, and women had a relatively subordinate familial role. However, there are cultural differences between Mainland Chinese citizens and citizens of Hong Kong. During the British colonial period the emergence of Western culture (i.e. "Westernization") created a mix of traditional Chinese culture and Western values. 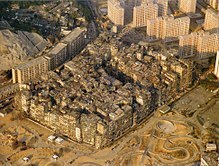 This created a unique culture of Hong Kong. 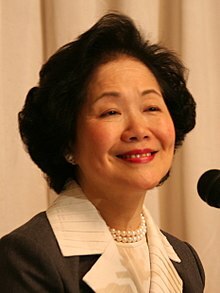 Along with the rapid economic and social development of Hong Kong since the end of the Second World War, a significant improvement in the role of women has been witnessed, while the male dominant society structure still persist in some aspects of women's lives. In Mainland China, women's roles have changed over time as well, but in different ways due to the influence of Mao Zedong's official ideology of gender equality, and Deng Xiaoping's economic reforms. Hence, women studies in Hong Kong are slightly different from China's, as citizens of Hong Kong often refrain from referring to themselves as Chinese but rather "Hong Kongers". Wong Ka Kui (10 June 1962 – 30 June 1993), was a Hong Kong musician, singer-songwriter and record producer. 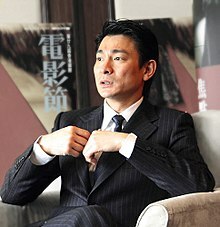 He rose to prominence as lead vocalist, rhythm guitarist, main songwriter and founder of the rock band Beyond in a large majority of Asian countries. ... that since its replacement on 1 July 1997, the former flag of Hong Kong is used as a symbol of protest against perceived Chinese interference in Hong Kong? ... that in 1985, China–Hong Kong football rivalry resulted in China's first recorded case of football hooliganism? ... that Liu Yichang, considered the founder of Hong Kong's modern literature, wrote novels that inspired two award-winning films by Wong Kar-wai? ... that a television crew captured the beating of a handcuffed protester by police during the 2014 Hong Kong protests?